PLEASE ALLOW 4 TO 6 WEEKS FOR DELIVERY! Due to a previous contractual agreement, Francisco Lindor's signature does not appear on the Team Signature Bat. The City of Cleveland is enjoying unprecedented success as sports fans witness not just a championship by the Cavaliers, but also the ascension of their Indians to the World Series after defeating the Blue Jays in the ALCS. 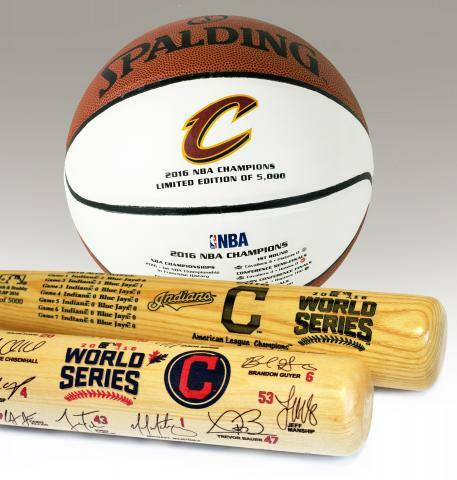 To celebrate this great time in Cleveland sports history, we are proud to release this very unique City of Champions Commemorative Set featuring one (1) Cavaliers 2016 NBA Champions Basketball, one (1) Indians 2016 Team Signature bat, one (1) Indians 2016 Louisville Slugger World Series bat and one (1) Cleveland Skyline Two Bat Holder (included FREE). 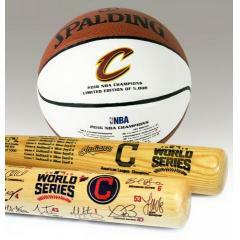 This is the ultimate Cleveland sports fan memorabilia collectible set, but it is available only as a limited release so order your set today. The price of this set includes a $79.95 savings over ordering these items individually. Due to the limited release of this set we must charge your credit card for the full amount immediately upon taking your order. This policy ensures we reserve a Champions set for you. We will confirm your order by Email. The bats and basketball in this set are not game used. Please allow 4 to 6 weeks for delivery.